The Rangers need to get back to the gameplan that gave them success in Game 4; aggressiveness, quicker decision making, and more shots. Photo courtesy of MSG Photos. The Rangers were stifled on Sunday night, bringing them to within one game of elimination for the second series in a row. That forces the Rangers to win Game 6 in Tampa Bay in order to extend their season, and bring the series back to Madison Square Garden for a Game 7. The Rangers did not play all that well in Game 5, managing only 26 shots on goal despite largely controlling possession for most of the game. All of the zone time didn’t lead to shots on goal, as the Lightning did a good job of forcing the Rangers to the perimeter and blocking lots of shots. Surprisingly, none of the success from Game 4 carried over to Sunday for New York. The Rangers scored five goals on 26 shots in that game, were more crisp, decisive and efficient with their passing and playmaking, and didn’t allow the Lightning to implement their style of play. They executed their gameplan flawlessly and came away with a win. Alain Vigneault needs to get his team to play just like that again. The Blueshirts were trying to pass their way into the net last night, trying to make too many plays and be too “cute” as some analysts would say. Rather than shoot the puck and look for deflections, rebounds, and dirty goals, the Rangers were trying to make perfect passes and score that way. In the playoffs, that usually doesn’t work. The first thing that needs to change is the physicality. In Game 4, it was clear that the Rangers were trying to hit and use their size to take Tampa Bay’s speed game out of the factor. And it worked, really well for the first two periods or so. The Lightning were really thrown off by all of the hitting, and the Rangers were able to force turnovers and get to the front of the net. The Rangers need to get back to the physical style of play that they implemented in Game 4 in order to take Tampa’s speed out of the game. Photo courtesy of MSG Photos. Crashing the crease was another thing that was nowhere to be found during Sunday’s game. The Rangers did absolutely nothing to try and set screens on Bishop, battle in front of the net, and get to the middle of the ice. Chris Kreider, who has been an excellent net-front presence throughout the playoff, was not near Bishop at all. No Rangers’ players were in the middle of the ice for rebounds and redirections, which made their offense one dimensional and easy to defend. Get to the front of the net and score those gritty, dirty goals. That’s how you win in the playoffs. Another area that the Rangers need to improve in is their decision making. Too often in Game 5 the Rangers took too long on deciding if they should shoot the puck or make a pass, which allowed the Tampa defenders to get to the puck carrier. Instead of getting a shot on goal, they’d wait, and then the pass would get deflected or intercepted. It’s pretty aggravating to see the point man fake a shot and cycle the puck countless times. Eventually, someone needs to take a shot in order to score. 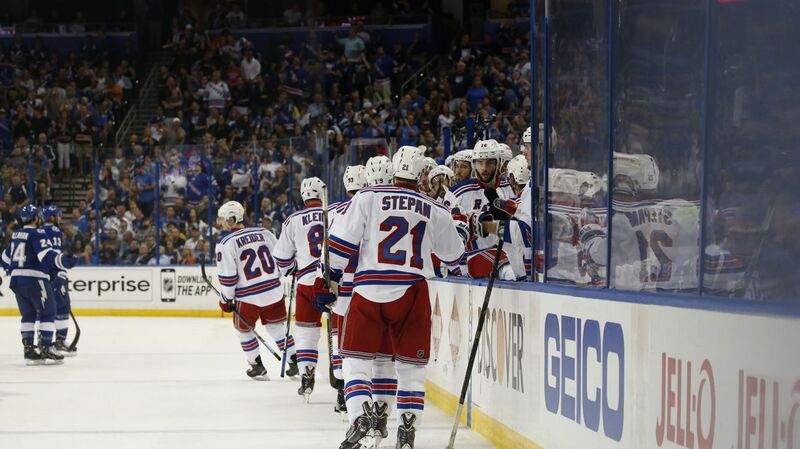 The Rangers let Tampa Bay’s shot blocking get into their head, and stopped taking as many shots. It’s really a simple fix. Just keep shooting the puck. It doesn’t matter how many times they block a shot, just keep giving them more bruises. Eventually one of those shots will get through and become a good scoring chance. This relates to the power play. The Rangers were 0-4 on the man advantage last night, which wound up being a huge momentum killer and a big reason why the Bolts were able to gain some confidence. I don’t have an official count, but they may have gotten five shots on goal on four separate power plays, including one full two minute man advantage where they did not get a shot at all. Again, it was just too much passing, indecisiveness, ad unwillingness to get to the front of the net and create havoc and opportunities. 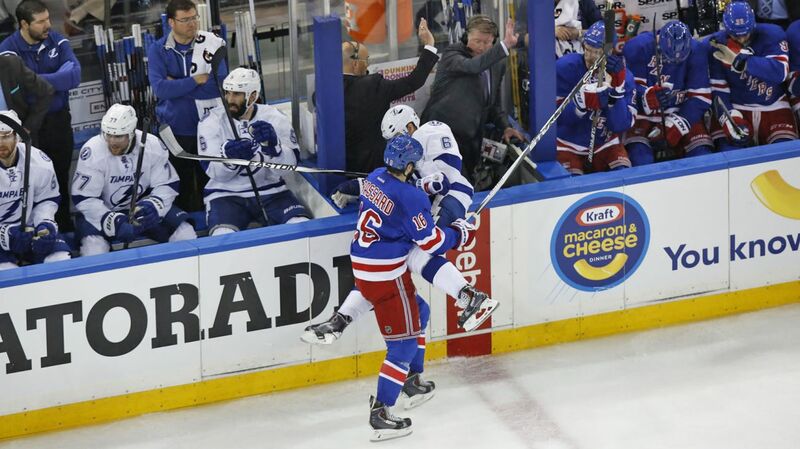 If the Rangers are going to win tomorrow night, they need to get back to the same strategy they employed in Game 4. Be aggressive and use physicality to eliminate Tampa’s speed game. Make quick decisions when it comes to passing and shooting, both at even strength and on the power play. Shoot the puck more, even if it keeps getting blocked. Crash the crease. Create havoc in front of Bishop. Look for redirections and deflections. And get to the middle of the ice to clean up and score on second chances. And most importantly, come away with a win. Posted on May 25, 2015, in In the Crease and tagged Alain Vigneault, Ben Bishop, Cam Talbot, Carl Hagelin, Chris Kreider, Dan Boyle, Dan Girardi, Derek Stepan, Derick Brassard, Dominic Moore, Hartford Wolf Pack, Henrik Lundqvist, James Sheppard, Jesper Fast, JT Miller, Keith Yandle, Kevin Hayes, Kevin Klein, King Henrik, Madison Square Garden, Marc Staal, Martin St. Louis, Mats Zuccarello, Matt Hunwick, MSG, MSL, New York Rangers, NHL, NHL 2014-2015 Season, NHL Playoffs, NY Rangers, NYR, Rangers, Rangers Nation, Rangerstown, Rick Nash, Ryan Bourque, Ryan McDonagh, Stanley Cup Playoffs, Steven Stamkos, Tampa Bay Lightning, Tanner Glass, The Ranger Zone, Tyler Johnson. Bookmark the permalink. Leave a comment.